Unable to access any files through Parallels Shared folders in Windows XP/7/8/8.1. NOTE: If Shared Folders error message appears in Windows 10, check the article. Old version of Parallels Tools or corrupted registry entry. Start Parallels Desktop. Do not start your Virtual Machine or shut it down if it is running. Go to your Virtual Machine's Configuration -> Options -> Sharing and turn off (uncheck) Shared Profile feature. Start your Virtual Machine, go to Start -> Control Panel > Programs and Features and remove Parallels Tools. 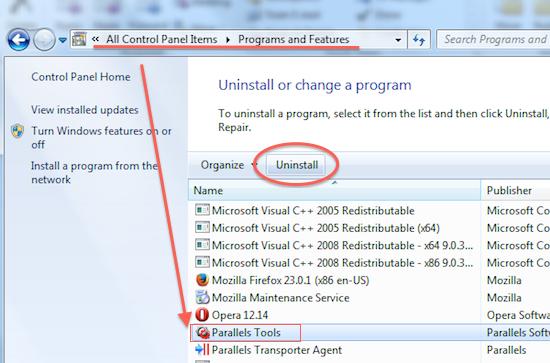 Once Parallels Tools are removed, reboot Windows and install Parallels Tools back. 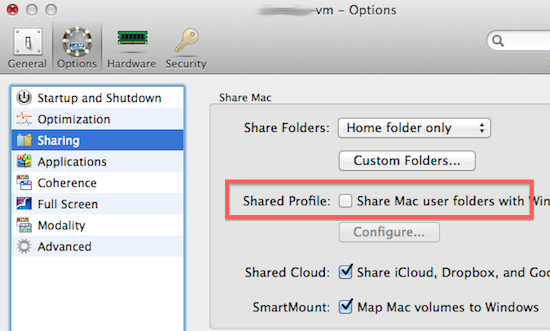 Go to your Virtual Machine's Configuration -> Options -> Sharing and enable Shared Profile.